Eden Prairie, MN (June 14, 2017) – The Minnesota Vikings will induct a pair of legendary wide receivers in the club’s Ring of Honor in 2017- Randy Moss and Ahmad Rashad. Vikings Owner/President Mark Wilf alerted both players of the honor earlier today. Moss burst onto the scene in 1998 with a record-setting Rookie of the Year performance and went on to rank among the NFL’s greatest WRs in his 14-year career. Moss ranks 2nd in NFL history with 156 receiving TDs, 3rd all-time with 15,292 yards and holds the NFL’s record for TD catches in a season with 23 as a New England Patriot in 2007. Moss holds the Vikings career record with 41 career 100-yard games. Moss set the NFL rookie record with 17 TDs in 1998 and had 17 again in 2003, to tie the Vikings record for a season twice. In his career, Moss posted 10 seasons of 1,000 yards, good for 2nd in NFL history and also ranks 2nd in NFL history with 64 career 100-yard games. Moss went to 5 Pro Bowls (1998, ’99, ’00, ’02, ’03) with the Vikings and was All-Pro 3 times (1998, ’00, ’03) with the Vikings, was named to the 2000s Team of the Decade and started 108 of his 113 Vikings games along with 8 playoff contests. For his 14-year career, Moss had 982 receptions for 15,292 yards and 156 TDs with an average per catch of 15.6 yards. He played in 218 career games with 193 starts. 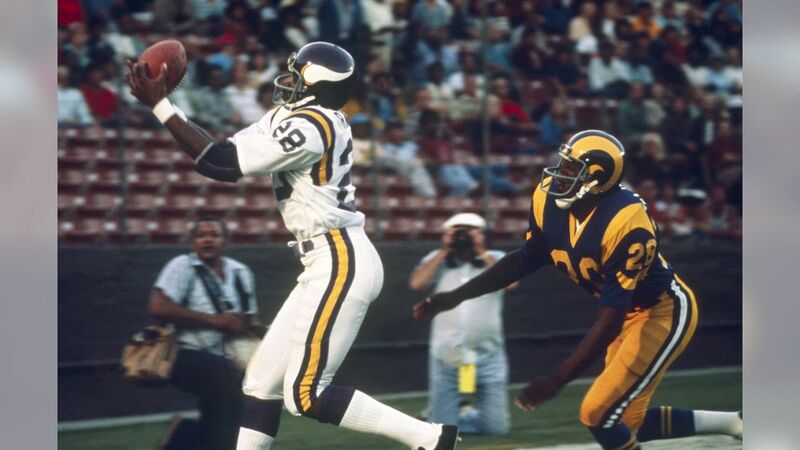 Rashad enjoyed the best seasons of his 10-year NFL career with the Vikings, playing 7 seasons for the team (1976-82). A 4-time Pro Bowler, Rashad represented the club 4 straight years from 1978-81 and was named Pro Bowl MVP to cap the 1978 season. He led the team in receiving 3 times- 1977, ’79 and ’80 and was the 1st Vikings WR to notch consecutive 1,000-yard season in 1979 and ’80. His 80 receptions in 1979 was 2nd in the NFL and he led the NFC in receptions twice (1977, ’79). Rashad had 6 seasons as a Viking with 50 catches, tied for 2nd-best in franchise history with Randy Moss and only trailing Cris Carter’s 11. Rashad still holds Vikings records for TD receptions in a game with 4, set against San Francisco (9/2/79), also an opening-day record. His 160 yards in the 1980 opener vs. Atlanta (9/7/80) still stands as the Vikings opening-day record. Rashad started 95 of his 98 games played as a Viking. He caught 400 passes in purple for 5,489 yards and 34 TDs, most notably the Hail Mary pass from Tommy Kramer, a 46-yarder as time expired at Met Stadium against Cleveland (12/14/80). Rashad played in 139 career NFL games, beginning his career as the 4th overall pick by St. Louis in 1972. He played for the Cardinals, Bills and Vikings from 1972-82. Moss and Rashad will be the Vikings first Ring of Honor inductees since 2013, as the team did not induct a former player during the two seasons at the University of Minnesota and the inaugural season at U.S. Bank Stadium. Their additions will bring the Vikings Ring of Honor to 23 members. Current members include: Fran Tarkenton, Alan Page, Jim Finks, Bud Grant, Paul Krause, Fred Zamberletti, Jim Marshall, Ron Yary, Korey Stringer, Mick Tingelhoff, Carl Eller, Cris Carter, Bill Brown, Jerry Burns, Randall McDaniel, Chuck Foreman, John Randle, Scott Studwell, Chris Doleman, Matt Blair and Joey Browner. View the top images of former Vikings WR Randy Moss as he celebrates his birthday on February 13th. View the top images of former Vikings WR Ahmad Rashad in his career in Minnesota as he will be inducted into the Vikings Ring of Honor.